Metro Detroit MI party or celebration! 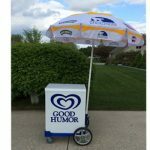 Detroit Metro Ice Cream is a Michigan ice cream cart rental business that is providing some extra fun for your upcoming Birthday Parties, Graduation Parties, Weddings, Sporting Events, School Parties/End Of Year Bashes, and many more! Detroit Metro Ice Cream caters their ice cream cart rental service to Oakland County and Metro Detroit, Michigan. 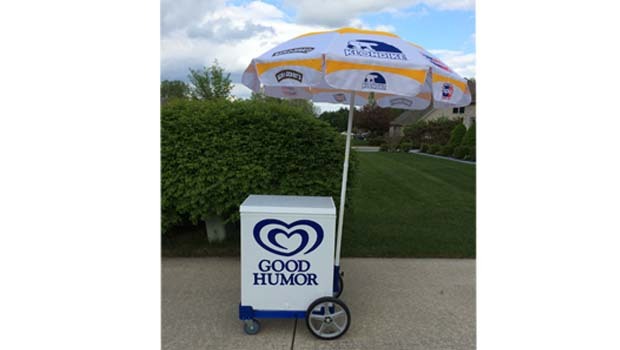 Guests at your party will enjoy classic, delicious ice cream selected directly from a Good Humor ice cream cart that is conveniently delivered to your door, stocked and ready to use. There are 2 ice cream cart styles to choose from, one is the chest style with sliding glass top and the other is the rolling cart with the umbrella. The chest style is much easier to see product, and easier for kids to grab in and out of. It also has more room than the umbrella style. The umbrella style is a bit smaller, and has a classic push cart design with a unique umbrella with all your favorite ice cream brands. Both ice cream cart styles can conveniently plug into an outlet, and require no dry ice. Dry ice may be used if Detroit Metro Ice Cream is transporting the carts a long distance to prevent melting. Detroit Metro Michigan Ice Cream Cart Rental pricing for each ice cream cart starts at $100 for a full day, which includes set up, and pick up after the party or event. The cart can be picked up the same night of your event, or the next morning. Detroit Metro Ice Cream also offers all of the ice cream available for purchase through them. Customers can choose their favorite ice creams from a master list, and let Detroit Metro Ice Cream know how many boxes of each ice cream they would like stocked in their ice cream cart. Detroit Metro Ice Cream will deliver the ice cream cart stocked with the customer’s selections – all frozen and ready to go. Detroit Metro Ice Cream offers all the goodies – Good Humor, Ben & Jerrys, Popsicle, Klondike, etc. 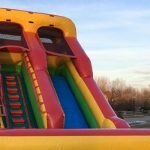 Detroit Metro Ice Cream now rents inflatable bouncehouses! Choose from Castle Bounce bouncer or a 16′ Slide that can be used as an inflatable waterslide. Detroit Metro Ice Cream has also added Tent / Table / Chair Rentals, as well as Catering, photo booths, and event planning to its service offerings. Choose among different party packages that include a tent, tables, chairs, and an Ice Cream Cart for one price, or customize your own package. Detroit Metro Ice Cream also has access to more products if you have a specific request! Feel free to contact them with any questions or special requests. See related posts below or our OAKLAND COUNTY/BIRTHDAY PARTIES tab for more Oakland County and Metro Detroit birthday party places and packages. Contact us at 248-852-4442 to be listed in our Birthday Party Directory. 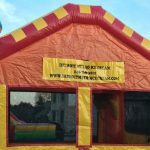 For more info on ice cream cart rental or inflatable bounce house rental in Metro Detroit MI, visit Detroit Metro Ice Cream website.